Here we are at the end of September. 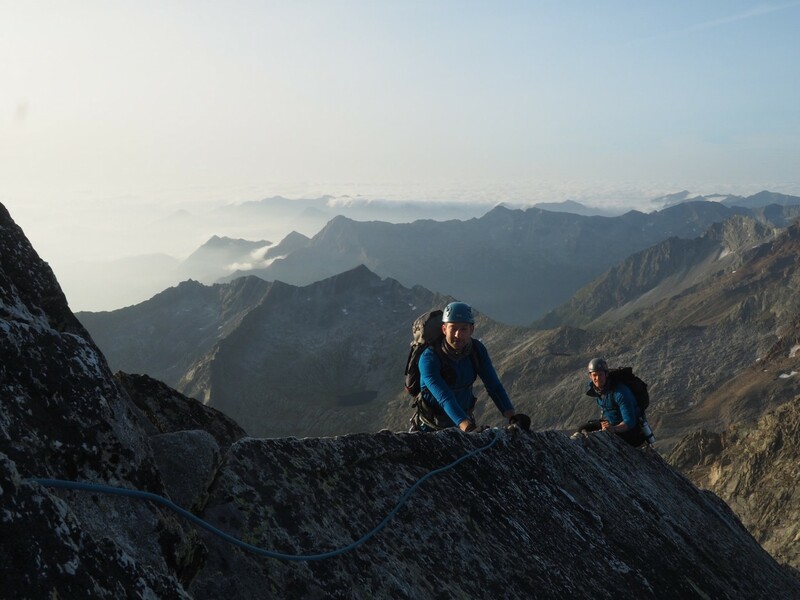 As the nights draw in, temperatures start to drop and the leaves in the valley start to turn red and gold, it’s time to reflect on an unusual summer of alpine climbing. If you kept any sort of eye on weather and conditions outside the Oval Office, you’ll be aware that it’s been a hot summer. 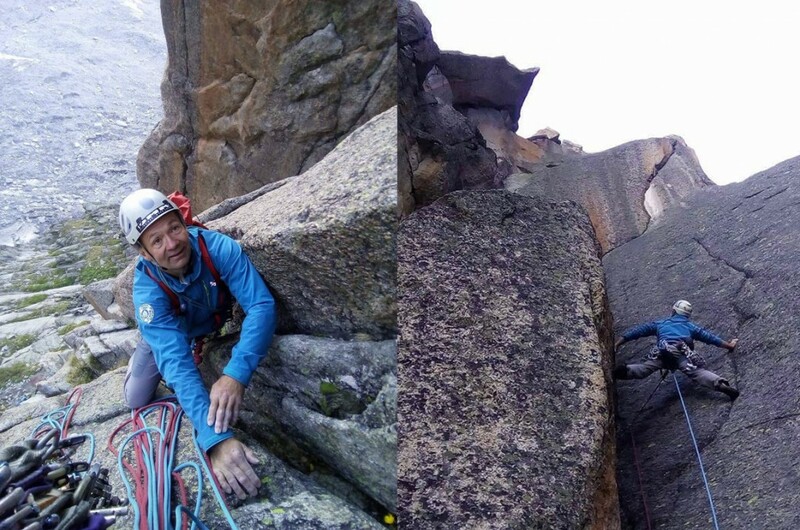 Combined with the lack of snow cover during the winter, this has made for a summer season where it’s been essential to adapt climbing objectives to suit, whether for guiding work or personal play. 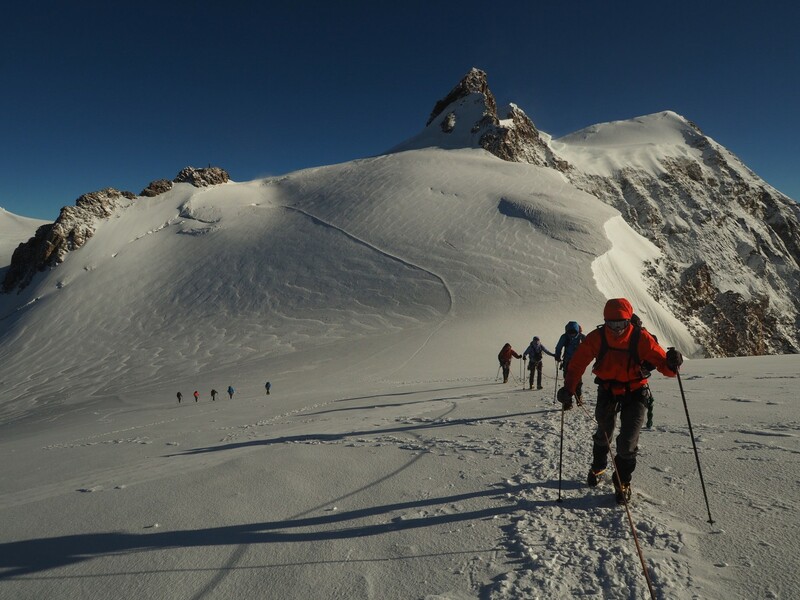 Of course, a good proportion of my guiding clients come out to the Alps with the intention of getting on snow or mixed routes, what might be regarded as “classic alpinism”. And certainly if you got lucky, it was possible to get some of those in. In the first week in June I started the season with Mont Blanc in really good condition. But by mid June temperatures had soared and the thin snow cover was being stripped back back to the underlying rubble and black ice. The glaciers gaped with huge crevasses, and the surface was hard and unforgiving of any crampon footwork errors. 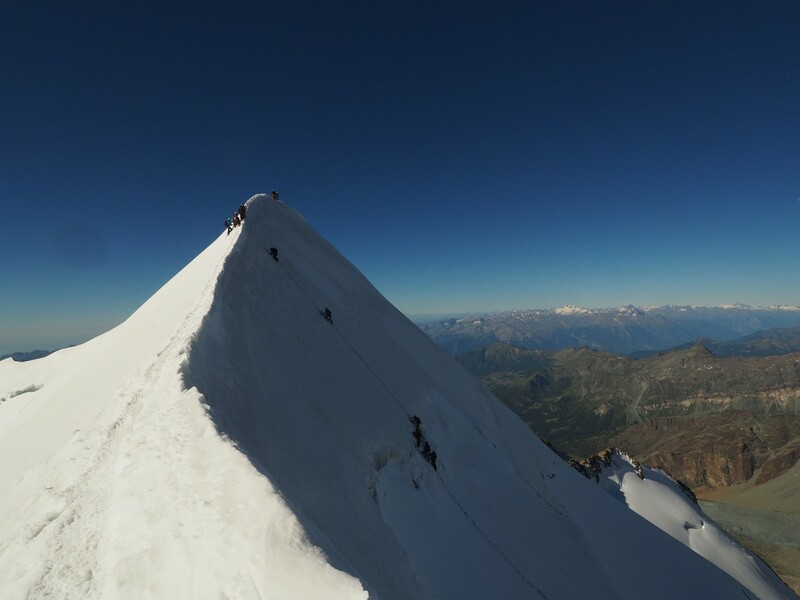 I managed Castor in mid July but it was on the limit of acceptability and it was only at the end of the summer that conditions felt more “normal” on the last day of my summer work in early September on Piramide Vincent. 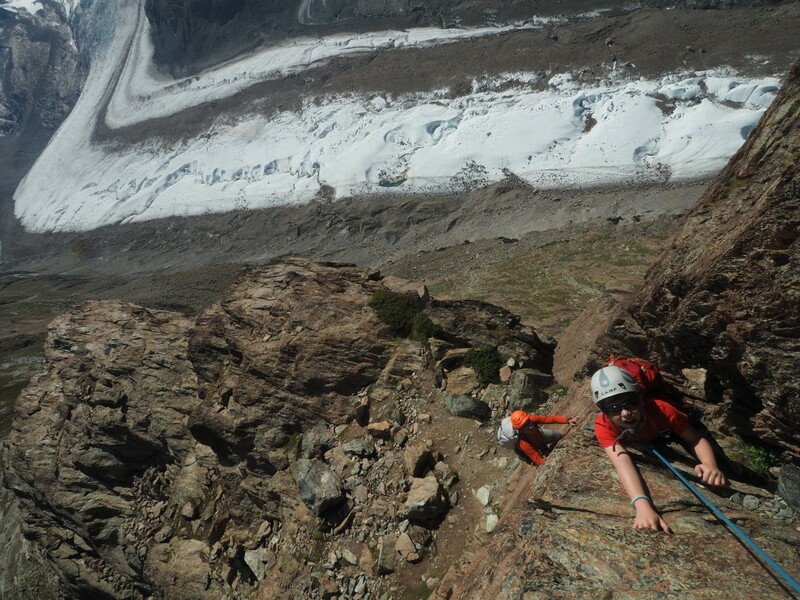 Toby Sheppard getting his first alpine summit, the Riffelhorn, aged 11 with his dad Darren. I’ve also climbed with Darren’s dad in Scottish winter conditions, so being in the hills with 3 generations of the same family was a very good tick indeed. 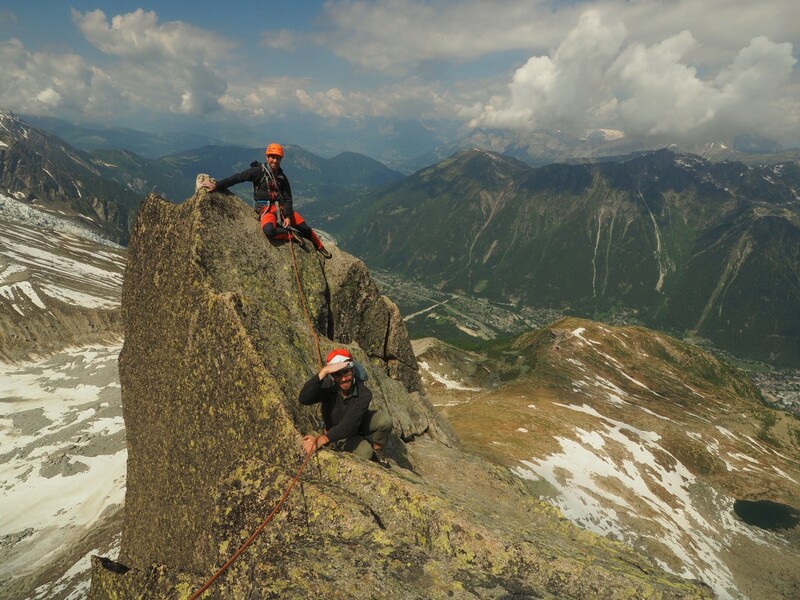 The Arête de Papillon with Mike and Eoin, the first time for me on this Chamonix classic. In my alpine apprenticeship, I seemed to miss out on this somehow – too much time on things like the Fou and the Freney might have something to do with that. So it was great to bivvy in an old school style at the Lac Bleu, grab an hour’s leeway on the teams from the first bin and have it to ourselves. The Portjengrat in the Saas valley of Switzerland, done in under guidebook time with Will and Dave. I would regard this as much a classic alpine route as any snow outing. 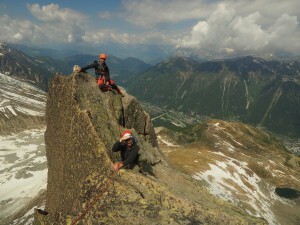 Technical and committing too, and a fine effort from 2 lads on only their second summer alpine season. 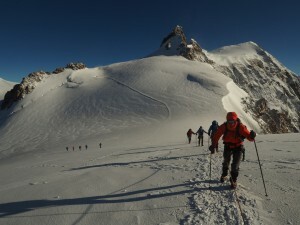 Right at the beginning of the season, Tim Blakemore and I decided we “needed to acclimatise for Mont Blanc” by skiing in to the Pointe Lachenal and climbing the classic Contamine route. I last did this in the 80’s so it was great to come back to. I also did a route on the Croix de Fer above Sallanches, the Walker Spur of the Vallée de l’Arve. 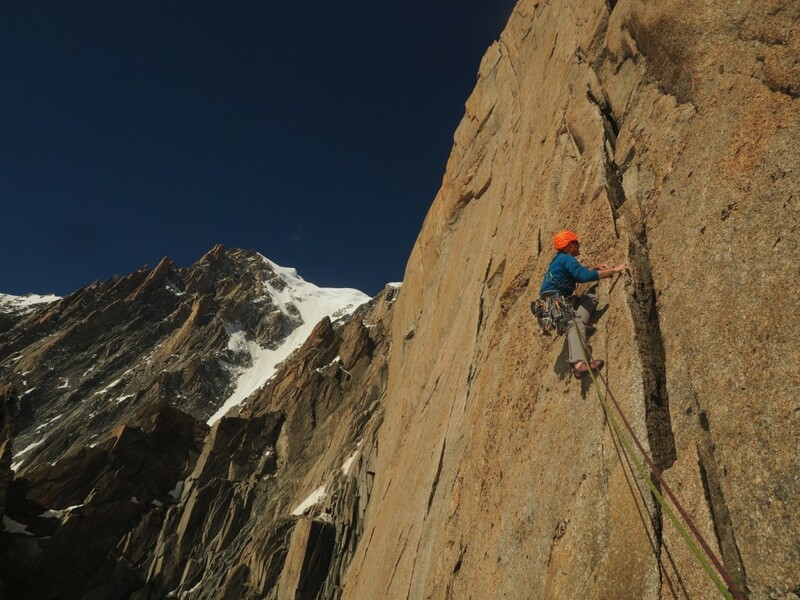 Ni Dieu Ni Maitre involved 11 hours car to car and 7 pitches of climbing up to 6c made it feel like a proper day out. I’ve also had a couple of cracking days with Ross Hewitt. More known for his steep ski achievements, Ross is a super motivated character and handy on rock as well. 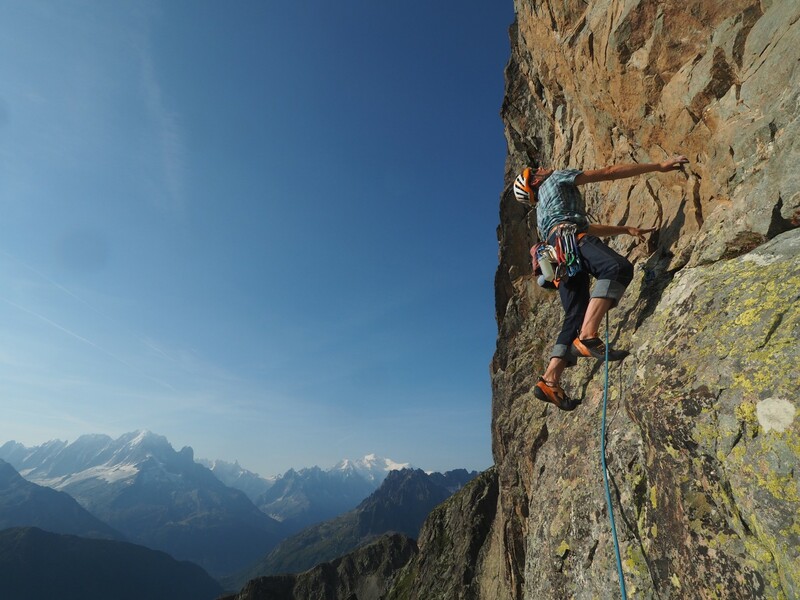 We had a great day on the West face of the Blaitière getting involved in quintessential Chamonix granite feistiness on Charles Eternue. 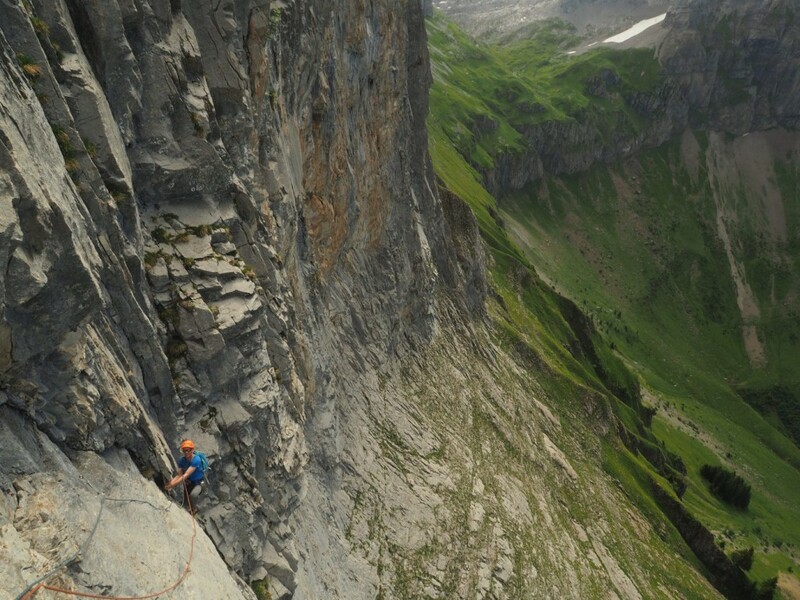 And towards the end of the season, we bagged a fantastic multi pitch free route on the Perrons. Bada Boom was about 9 hours car to car with not much time standing still at all. At up to 7b with only a couple of falls, it felt like a proper work out. Like many other climbers, guides work much harder on their days off than when they’re at work. And now it’s proper autumn – time to keep the rock climbing on the go with trips to the Peak District, Kalymnos and Morocco. Before we know it, there will be snow on the ground and it’ll be time to dust off the skis. But not just yet – skiing is great but you can’t beat the real thing. Climbing.